I have family in Yorkshire, they like to give me Yorkshire based gifts. Whilst I love Henderson’s Relish and Yorkshire Rhubarb, Yorkshire wine wasn’t a real hit. Maybe this year’s vintage will have enjoyed some sun and will be a delight, I’m sure I’ll find out soon. I was pleased to see that this bottle from Yorkshire was gin. I’ve never seen a Yorkshire gin before, but as everyone seems to be turning their coal shed into an artisan distillery, it was only a matter of time. 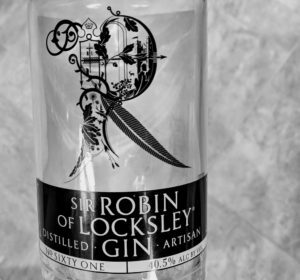 For those of you from outside England, Sir Robin of Loxley may be better known to you as Robin Hood, perhaps not a man known for sipping cold gin or mixing a mean Martini, but there’s no historical evidence to suggest he didn’t steal gin from the rich and mix it with the tonic of the poor. The gin is clean and bright. It smells of citrus and something wild and forest-like. That may be me adding a little romantic touch to the smell, but I think it’s more likely to be the dandelion coming through. Sadly no burdock, but I’m sure a shed in Scotland is working on that right now. There’s elder flower too. This is a real gin, with plenty of juniper, which is complemented by the botanicals, particularly the dandelion, elder flower and grapefruit flavours. There’s an odd tendency to make gins with ever more outlandish botanicals that flood the palate and drown out the gin. Whilst several of them make really nice drinks, a raspberry gin with lemonade is a delight, but it’s not gin as we know it, some are just downright awful drinks designed for people who don’t like gin, but want to order it anyway – I’m looking at you “salted caramel gin”. At 40.5% it’s a sensible alcohol level, in the Goldilocks zone. I’d gladly choose this gin for a G&T or a Gibson, because it’s good rather than because it’s a Yorkshire one, or Robin Hood’s choice. Maybe I’ll give Yorkshire Rhubarb gin a go, one day.